Stephanie K Brownell is a multidisciplinary artist holding an MFA in Playwriting from Boston University. Her creative work is visual, intersectional and magical, with a particular focus on the body. She has published poetry in Typishly Literary Journal and Formercactus and fiction through CW Publishing. Her scholarly work focuses on discourses of oppression, resistance, and imagination in contemporary and speculative literature. She teaches writing through GrubStreet, the nation’s larges creative writing center, and consults as a freelance editor. She has previously taught at Boston University, Bentley University, Lycée Marguerite de Valois, the Cambridge Center for Adult Education, and the Elliot School. 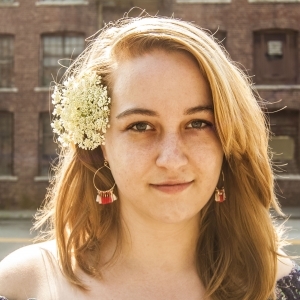 Stephanie is a 2018 Sewanee Conference Tennessee Williams Scholar, a member of the Dramatists Guild of America, and an alumna of residencies and fellowships nationwide including Company One’s PlayLab, the O’Neill National Playwrights Conference Kennedy Center Fellows, Ensemble Studio Theatre’s New York Theatre Intensives, and Taleamor Park Residency. She is a winner of the National Partners of the American Theatre Playwriting Excellence Award, a Gary Garrison Award national finalist, and the UT WomenWorks 2015 runner up. Her play She Eats Apples has been produced by Boston Playwrights’ Theater, Breaking Barriers Theater Education Program, and Queensboro Community College. Chop has received development through Boston Playwrights’ Theater’s Breaking Ground Series and Artists’ Theater of Boston’s Summer Happenings. “Eskimo Pie” was produced by the KNOW Theatre Company and Elements Theater, in addition to several readings. Most recently, her play “A House of a Different Color” was produced as a part of This Place/Displaced, a theatrical challenge to gentrification, by Artists’ Theater of Boston. As a costume designer, Stephanie is interested in the use of garments to express and repress as well as the evolution of gendered expression. Local collaborators include Company One, Boston Playwrights’ Theatre, New Rep, Greater Boston Stage Company, Boston Symphony Orchestra, American Repertory Theatre, Apollinaire Theatre, Titanic Theatre, Flat Earth, Bridge Rep and more. Most recently, Stephanie designed the premiere of Paul Michael Thomson’s Leave Me Alone! at The Story Theatre, Chicago. Talk to her about social justice, speculative fiction, color coding, and French on instagram @skbrownell or at skbrownell.com.